We’re very excited to publish our 32nd Annual Santa Barbara International Film Festival podcast. This year, Frank was able to get red carpet interviews with Executive Director of the festival, Roger Durling, film historian Leonard Maltin, Naomie Harris of MOONLIGHT, Stephen McKinnley Henderson of FENCES, David Crosby who wrote and performed an original song for LITTLE PINK HOUSE, filmmaker Derek Wayne Johnson who premiered his film, JOHN G. ALVIDSEN: KING OF THE UNDERDOGS at SBIFF, Aaron Taylor-Johnson of NOCTURNAL ANIMALS, and filmmaker Damien Chazelle who wrote and directed LA LA LAND. On the latter half of the podcast, Frank is joined with Devin Godzicki who took photographs and attended panels with Frank at this year’s SBIFF. They discuss a film they saw, SEPTEMBER 12th, and end the conversation with a brief chat about LA LA LAND. The 32nd Santa Barbara International Film Festival opened last night with the cathartic and uplifting documentary CHARGED: THE EDUARDO GARCIA STORY. Eduardo was shocked with 2400 volts of electricity that cost him am arm, ribs, and nearly his life. The film is an inspiring story of resilience, passion, and the eternal flame of the human spirit. Executive Director of the festival, the ever so dashing Roger Durling, introduced the film in a candid and heartfelt speech. He spoke about the power of film, how it can not only inspire us, but also save our lives. Durling then went on to speak about how he is not only an immigrant, but also an American. He spoke passionately and proudly of how the festival is showcasing films from fifty different countries and how cinema and the arts are so powerful, they can deconstruct walls. 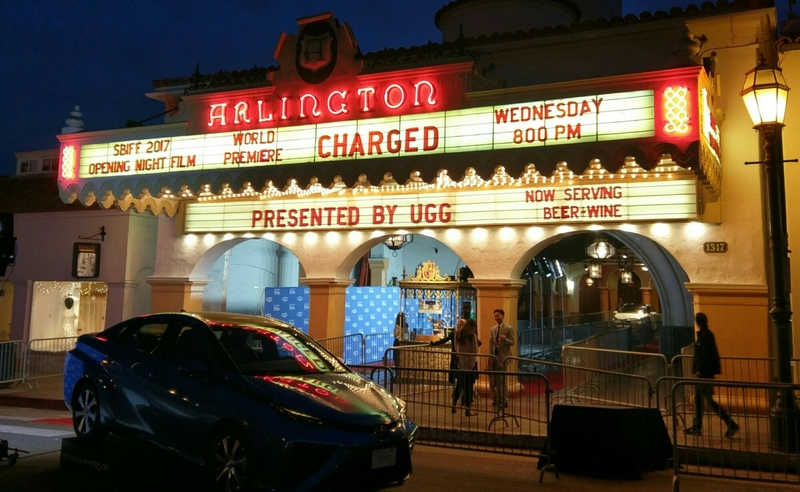 CHARGED is a fascinating film, and marks the second time in the festivals thirty-two years that it has opened with a documentary. Coming up, Denzel Washington will be receiving the Leonard Maltin Modern Masters Award, celebrating Washington’s career right as he comes off his Screen Actors Guild award for FENCES, poising himself as the front runner in the Best Actor race. There is much, much more to be excited about at this years festival. Ryan Gosling and Emma Stone will be awarded Friday. In total, sixteen actors who have been nominated this year for an Academy Award will be hosted. Stay tuned for our SBIFF podcast that will feature red carpet interviews! 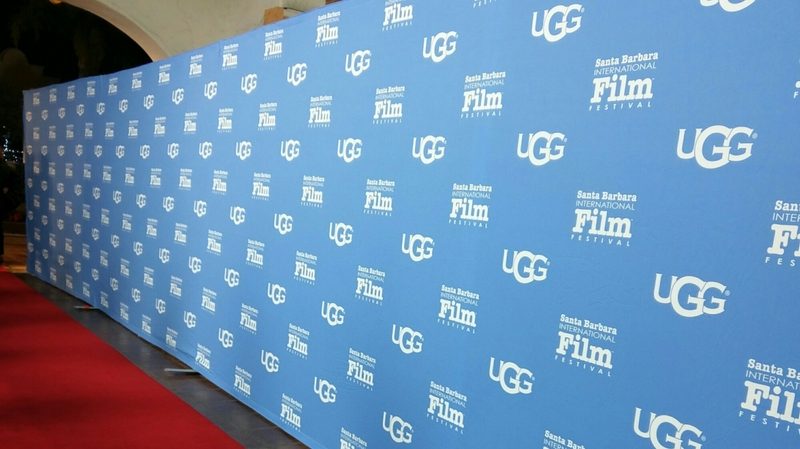 Our coverage of the 31st Santa Barbara International Film Festival is up! This has been our first red carpet coverage, and included are interviews with actors James Morrison, Michael Keaton, Rachel McAdams, Carl Weathers, film historian Leonard Maltin, filmmakers Benjamin Cox of STEREOTYPICALLY YOU and Tom McCarthy of SPOTLIGHT, producers Marcia Nasatir (THE BIG CHILL, COMING HOME, IRONWEED) and Sarah Green (THE NEW WORLD, THE TREE OF LIFE, TO THE WONDER, KNIGHT OF CUPS) and executive director of the Santa Barbara International Film Festival Roger Durling. We then dive in, head first, into Terrence Malick’s new film KNIGHT OF CUPS which had it’s US Premiere, and was the Centerpiece film at this years fest. We would like to thank Roger Durling and the staff of the SBIFF for accommodating Podcasting Them Softly at the festival this year. To find out more about the SBIFF please click here. Everyone was waiting. Leonard Maltin was waiting, Roger Durling was waiting, Scott Cooper was waiting, the press was waiting, and the giant mob of screaming fans were waiting. Johnny Depp was running late, and nobody cared. Depp arrived thirty minutes late. He was set to receive the Leonard Maltin Modern Master Award from BLACK MASS director, Scott Cooper as well as participating in a much anticipated Q&A with Leonard Maltin. Depp was quickly moved into the Arlington Theatre and the floodgates opened and everyone rushed in. Once the gorgeous Arlington Theatre settled down, the dapper Roger Durling took the stage and he spoke graciously, thanking everyone for being there and thanked Johnny Depp for coming. Maltin then took the stage and he introduced Depp and an excellently edited highlight reel played. Watching a brief highlight of Depp’s career doesn’t do it justice, yet you can’t help feeling overwhelmed by his truly epic career. Depp walked out, and the theatre erupted with applause and screaming. Depp shyly smiled. To this day, Johnny Depp is the epitome of cool. He was wearing socks with hemp leaf patterns and for about the first hour and a half of the Q&A, he meticulously hand rolled a perfect cigarillo. He then lit it and took the rest of the Q&A slowly smoking it. In California, and pretty much anywhere else, it is illegal to smoke in a public venue, but who is going to tell Johnny Depp to stop smoking? Depp is a very sweet guy, he’s incredibly humbled. Whenever Maltin would bring up a film, whether it was one of Depp’s blockbusters or a seminal undercard performance, the audience would clap and Depp would smile and thank the audience. The Q&A with Leonard Maltin was almost three hours long and it was wonderful. I was able to ask Leonard Maltin two quick question on the red carpet, I asked him to pick between DONNIE BRASCO, ONCE UPON A TIME IN MEXICO and SWEENEY TODD. Maltin paused for a moment and said DONNIE BRASCO. I then asked him what his favorite underrated performance of Depp’s was and he said, without hesitation, DON JUAN DEMARCO. It took about an hour for Depp to warm up and get comfortable. He was incredibly candid about his career. He spoke frankly about how he’s a musician, who happened to become an actor to pay the rent. He spoke in depth about what a horror he was, and sometimes still is, on film sets. Maltin asked him about his relationship with Leonardo DiCaprio on the set of WHAT’S EATING GILBERT GRAPE. Johnny Depp just started laughing. Depp briefly spoke about his work with John Waters, saying how Waters was the only filmmaker he knew who made a film based on a title. He said Waters came up with the idea of PECKER, solely for the fact that when it would be advertised it would be: John Waters’ PECKER Coming Soon. When Depp was asked about his casting in EDWARD SCISSOR HANDS and his long and awesome collaboration with Tim Burton, Depp started laughing. He spoke about how he didn’t want to even meet with Burton, he knew he wouldn’t get the part, but his agent Tiffany talked him into it. Depp recalled walking into a diner to meet Burton. He had no idea what he looked like. He scanned the diner and saw a guy “whose hair looked like a hardware store exploded, and I knew I had to talk to him. Even if he wasn’t Tim, I still had to talk to him.” The man with the exploded hair was Tim Burton, and that was the beginning of one of the greatest collaborations in cinema history. Leonard Maltin beamed as he showed a clip of DON JUAN DEMARCO and then asked him about that film, and working with Marlon Brando. Depp settled back in his chair and smiled, and spoke about his abundant love and admiration for Brando. He said he was a father, mentor, brother, essentially a gigantic blanket that meant the world to Depp. When Maltin asked Depp to describe what he learned from Brando, he paused looked down, and then back up at Maltin and said: justice. Maltin asked Depp about the only film he directed, THE BRAVE that premiered at Cannes in 1997 and featured Marlon Brando in a prominent role. Maltin asked when we could see it. Depp asked the audience who wanted to buy it. He then went on to speak about the reason he shelved the film was because he didn’t want to play the distribution game, and he wanted to retain control over it. In 2004, when Brando died, Depp was devastated and he was receiving offers about releasing THE BRAVE. He was told it was a prime time to release the film, it was an unseen Brando performance, and now was the time to release it. That’s the moment when Depp decided to put the film under lock and key. He was returning justice back to Marlon Brando. Maltin then said that releasing it now wouldn’t be an exploiting Brando’s death. Depp then said he would show THE BRAVE at the Santa Barbara International Film Festival next year, and shook Maltin’s hand on it. So in theory, next year, Johnny Depp will be premiering his unicorn of a film, THE BRAVE, at the 32nd Santa Barbara International Film Festival. That remains to be seen, but seeing Depp speak, in depth, for three hours about his remarkable career was amazing. After the Q&A was over, Depp went back outside to all his screaming fans and took more photographs and signed as many autographs as he could. Johnny Depp is not only one of cinema’s best actors, but he’s truly a class act.